G.B. Proudfoot's hired Tyler Barnett Public Relations & Marketing last summer to drive awareness and sales of "For Pits Sake," a new line of natural deodorant. G.B. Proudfoot's is a family business founded in 2009 that sells natural body care products. 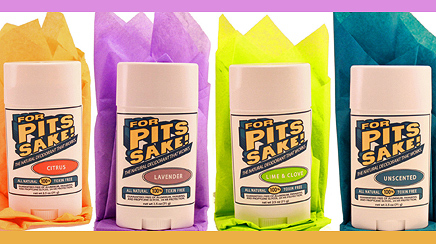 The company hired Tyler Barnett Public Relations & Marketing last summer to drive awareness and sales of "For Pits Sake,” a new line of natural deodorant. “I hit on [a formulation] that worked about a year ago, and the response was immediately so positive and strong that I realized if we didn't own it and promote it quickly we'd have copycats within a year and whoever got their name out first would reap the rewards,” explains president Cam Proudfoot. The campaign gave consumers the opportunity to send odoriferous friends, family, and acquaintances anonymous "deodorgrams” that include product and a choice of three funny, but polite, messages crafted by the agency. Tact and controlling the deodorgrams' messages were critical to recipient trial and to protecting the brand, notes Proudfoot. Media relations and social media outreach drove awareness. A splash page was created on GBProudfoots.com to direct visitors to the deodorgrams tab. Message choices include: "You've always been such a cute little stinker, now you can just be cute and little! Please enjoy this hard-working natural deodorant sent to you from a caring friend." After gaining traction with mom blogs and general consumer online outlets, Barnett's team went after top-tier general consumer, lifestyle, and women's outlets. Select high-profile bloggers, glossy magazines, and newspapers got deodorgrams. G.B. Proudfoot's launched a product Facebook page and handled posts, which included tips and fun facts about body odor. About 115 stories ran in outlets including NPR, Huffington Post, Glamour.com, and Refinery29. Proudfoot is considering a similar approach for other products, such as mouthwash. The agency was hired again to continue media outreach for the deodorant and additional products.